Abducens palsy is one of the commonly encountered cranial nerve palsies in strabismus clinic. For large-angle esotropia, due to complete abducens palsies, various vertical recti transposition (VRT) procedures have been described. Hummelsheim and Jensen's procedure are especially popular among them. Risk of anterior segment ischemia and induced vertical deviation postVRT prompt to search for better procedures to correct the esotropia and also improve the abduction. Modified Nishida's procedure (no split, no tenotomy transposition) is one of the newly described procedure in this direction. We describe three cases of complete abducens nerve palsy treated by this procedure. Here, we present three cases of complete abducens palsy corrected by the modified Nishida's procedure. To the best of our knowledge, this is the first case report of modified Nishida's procedure in abducens palsy from India. 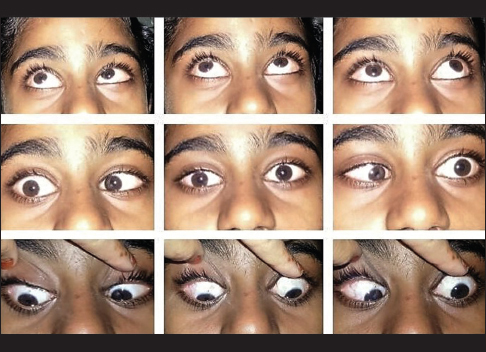 A 7-year-old girl presented with complaints of squinting since age of 7 years following trauma. Reviewing old records showed computed tomography (CT) brain with severe diffuse cerebral edema with linear fracture involving left petrous and occipital bones and was treated by neurologist then. On examination, her best-corrected visual acuity (BCVA) was 20/30 N6 for right eye (OD) and 20/20 N6 for left eye (OS). Hirschberg test showed RET, measuring 90–100 d ET on modified krimsky test. Ocular movements showed gross abduction limitation of −5 (both eyes [OU]) [Figure 1]. Rest of anterior and posterior segment examination was within normal limits. Diagnosis of posttraumatic bilateral abducens palsy made. Forced duction test was positive (OU). Modified Nishida's procedure with bimedial recession of 4.5 mm was done. Modified Nishida's procedure involved making radial conjunctival incision in superotemporal and inferotemporal quadrants. Ethibond 5-0 suture was inserted through temporal one-third of vertical recti muscle 10 mm behind their insertion [Figure 2]. The same suture was placed through sclera bite at distance of 12 mm behind limbus in superotemporal and inferotemporal quadrants. Same procedure was done in OU followed by routine medial rectus recession. Postoperatively, the child was orthophoric with abduction improved to −2 in OU at the end of 1st week. One-month follow-up, she had exophoria in primary gaze and improved abduction of −2 (OU) [Figure 3]. The second case is a 31-year-old man who came with c/o diplopia following trauma 2 months back. CT scan showed right temporal epidural hematoma and right temporal bone fracture involving petrous apex. He was under care of neurosurgeon. On examination, his BCVA was (OU) 20/20 N6. Cover tests showed 35 pd esotropia for distance and 25–30 pd esotropia for near. Abduction limitation of −3 was noted in OD. Rest of anterior and posterior segment examination was normal. He was given base out fresnel prisms and followed up closely. There was no improvement in lateral rectus function or esotropia 7 months later and surgery planned. Modified Nishida's procedure was done in OD. Postoperatively, the patient was orthophoric with improved abduction of −1 in OD. Ocular alignment was maintained 6 months postoperatively also [Figure 4]. The third case is of 43-year-old female who presented to us with h/o squinting OS since 1 year. She had undergone left lateral orbitotomy for cavernous hemangioma year back. Magnetic resonance imaging (MRI) then showed oval intraconal lesion in the left orbit extending up to orbital apex displacing optic nerve. History of left compressive optic neuropathy was noted in old surgical records. On examination visual acuity was (OD) 20/20, N6; (OS) HM+. Hirschberg test showed left esotropia measuring 50 pd ET. Anterior segment examination showed (OS) relative afferent pupillary defect and grossly pale disc s/o compressive optic neuropathy in OS. MRI was done now and showed no E/O residual tumor with absent lateral rectus muscle (OS). Diagnosis of S/P left lateral orbitotomy for cavernous hemangioma with left compressive optic neuropathy. left esotropia due to? Slipped left lateral rectus or? Compressive VI nerve palsy was made. Intraoperatively, LR was found intact. Modified Nishida's procedure with 3 mm medial rectus recession was done. The patient was orthophoric 1 and 3 months postoperatively. Various transposition procedures have been described for abducens palsy. Recent study by Gonzales et al. compared three different transposition procedures and found correction of 36 pd for full tendon transposition (FTT), 46.4 pd for FTT with resection of recti, and 41.3 pd for FTT with Foster's suture. 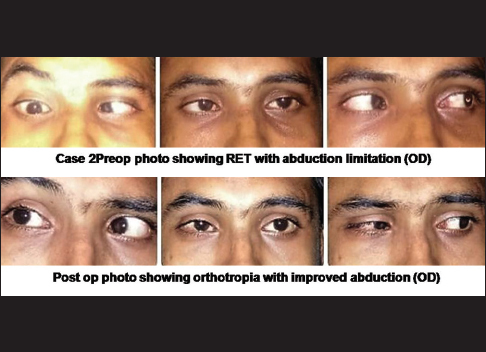 It was FTT reinsertion corrected the most esotropia and improved abduction to the greatest degree. Nishida et al. in 2003 reported ten cases of abducens palsy treated by a muscle transposition procedure in which the split halves of vertical rectus muscle bellies were sutured onto the sclera without tenotomy of the vertical rectus muscles. And concluded that it achieved similar postoperative results as VRT. Further, the authors modified this procedure without splitting the vertical recti muscle in 2013. This was performed by suturing the lateral muscle belly margins of vertical recti onto the superotemporal or inferotemporal sclera. These sutures transfer the lateral muscle bellies temporally and create additional muscle insertions as new points of action. Therefore, the transposed muscle bellies can generate abductional force at the suturing point. Nine cases of complete abducens palsy 6 unilateral and 3 bilateral cases were treated with this modified procedure. They reported correction of 24–36 pd by muscle transposition alone and of 50–62 pd along with medial rectus recession. Abduction improved beyond midline in all cases and none had anterior segment ischemia. They concluded that this procedure achieved same corrective results and was simple to perform as it requires only a suture from muscle to sclera. Tenotomy or splitting of muscles was unnecessary. In our case series, abducens palsy was posttraumatic in 2 cases and following orbital surgery in one case. Correction obtained was 30–35 pd with transposition alone and with MR recession, it increased to 50 pd similar to the above report. Abduction improved well beyond midline in all cases. No induced vertical deviation or anterior segment ischemia in our cases. Modified Nishida's is simple to perform, improved abduction, and corrected large-angle esotropia. This is the first report of modified Nishida's procedure in complete abducens palsy from India. 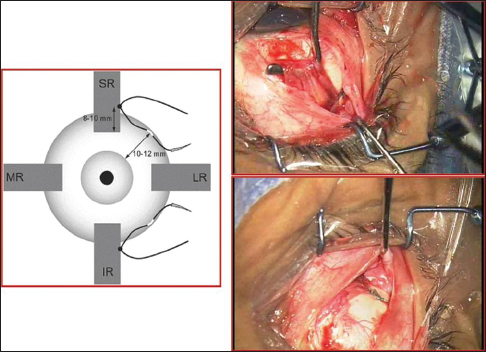 Brooks SE, Olitsky SE, deB Ribeiro G. Augmented Hummelsheim procedure for paralytic strabismus. J Pediatr Ophthalmol Strabismus 2000;37:189-95. Frueh BR, Henderson JW. Rectus muscle union in sixth nerve paralysis. Arch Ophthalmol 1971;85:191-6.
del Pilar González M, Kraft SP. Outcomes of three different vertical rectus muscle transposition procedures for complete abducens nerve palsy. J AAPOS 2015;19:150-6.
von Noorden GK. Anterior segment ischemia following the Jensen procedure. Arch Ophthalmol 1976;94:845-7. Nishida Y, Inatomi A, Aoki Y, Hayashi O, Iwami T, Oda S, Nakamura J, Kani K. A muscle transposition procedure for abducens palsy, in which the halves of the vertical rectus muscle bellies are sutured onto the sclera. Jpn J Ophthalmol 2003;47:281-6. Nishida Y, Hayashi O, Oda S, Kakinoki M, Miyake T, Inoki Y, et al. A simple muscle transposition procedure for abducens palsy without tenotomy or splitting muscles. Jpn J Ophthalmol 2005;49:179-80. Muraki S, Nishida Y, Ohji M. Surgical results of a muscle transposition procedure for abducens palsy without tenotomy and muscle splitting. Am J Ophthalmol 2013;156:819-24.